Pt nanopaticles were deposited onto electrospun In2O3 nanofibers via a solution approach. The products were characterized by X-ray powder diffractometry (XRD), scanning electron microscopy (SEM), transmission electron microscopy (TEM) and HRTEM in detail. The gas sensing properties of the as-prepared In2O3/Pt nanofibers were investigated. 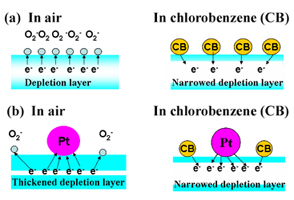 The presence of Pt nanoparticles is significantly enhancing the sensitivity about two times and decreasing response time from 45 s to 14 s toward toxic chlorobenzene vapor. The enhanced sensor performances are ascribed to the unique catalytic and electron sink properties of metallic Pt. The excellent sensing performances make the In2O3/Pt a promising candidate for applications in chlorobenzene detection.